I reviewed a copy of this book sent by the publisher. If cutting trees in one community today would save the trees in your backyard tomorrow, would it be worth it? Would you feel the same way if you lived in that community and the trees being cut down were the only ones in your entire neighborhood? The Asian longhornd beetle is from China and spends most if its life inside trees. One beetle cannot kill a tree, but one beetle will lay more than twenty-five eggs in its lifetime. And since beetles lay their eggs on the same tree, it is only a matter of time before the tree is weakened to the point of collapse. The first Asian longhorned bettle made its way to the US in 1996. The larva was lurking in the wood of shipping pallets, spools, and crates that came from China. The first Asian longhorn beetle was discovered in maple trees in Brooklyn, New York. Clint McFarland, federal project manager for the Asian Longhorned Beetle Cooperative Eradication Program in Massachusetts believes that the only way to kill Asian longhorned beetles is to cut down the infected tree and chip it to pieces. 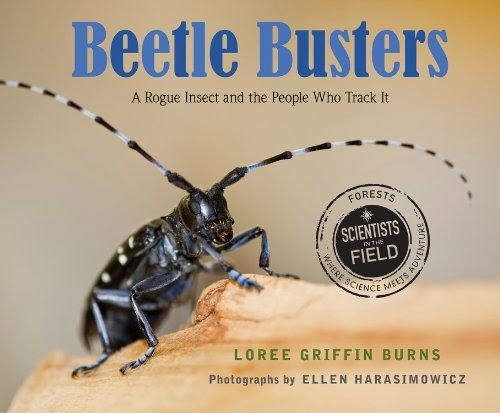 In her author’s note, Burns explains that the idea to write this book came after Asian longhorned beetles were found in her small town in Massachusetts. She wanted to believe in what McFarland and other scientists thought was the best way to destroy the beetles, but she also wanted to save her beloved trees. Like she did in Citizen Scientists, Burns challenges readers to roll up their sleeves and become a beetle buster. If we all work together, maybe we can eradicate this invasive pest that threatens to destroy our entire northeastern hardwood forests. The color photographs, maps, sidebars and absorbing text work together to make this new title in the Scientists in the Field series a must read. Back matter includes glossary, bibliography, and index.